We have had really good success with the Covercraft winter front/bug screens that we developed for ’94-’02; ’03-’09; and ’10-newer trucks. The design that we use allows the cover to be tucked behind the grill and under the hood of the truck. 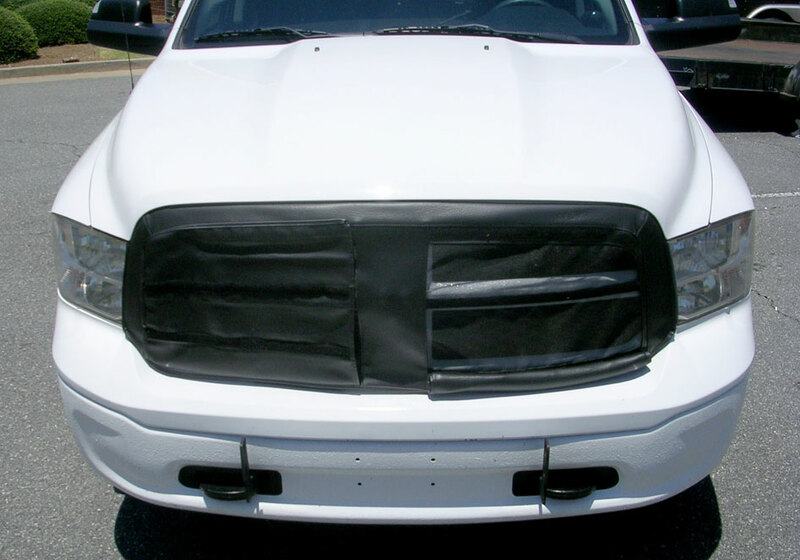 This is easy-to-install on the ’94-’02 and ’03-’09 trucks, but the ’10 and Newer/Fourth Generation owners have to remove the grill from the truck to install or adjust the cover. Left side covered up/Winter Front. Right side unrolled/bugscreen. For the Fourth Generation and EcoDiesel owners we looked at several designs and listened to our friends in Florida that have to contend with love bugs in May and September each year. 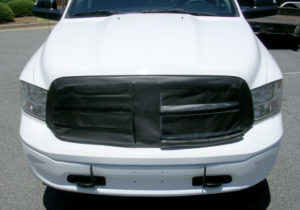 We settled on a design that is installed outside the engine compartment and fits over the truck’s grill. Simply pull the velcro loose and roll the flaps down to use the front as a bug screen in the summer, unroll and reattach the velcro for the cold winter months.